Then, on the flight to Chicago on Saturday morning I read about Sarah Reinertsen in Runner's World. As a child single-leg amputee, she was running the NYC Marathon 2 weeks before running Ironman Arizona. Ummmm, OK, ... that put things into a different perspective. To complicate things even more, I had been fighting some sort of virus all week AND I had a late night, party night celebrating my best friend's 45th birthday on Wednesday. It was going to be a game day decision. I had the opportunity to bail at 32k and jump on the train back to the finish line - I had the $2.25 tucked in my pocket and everything. I also knew that if I was feeling awesome I could finish the race! We arrived in Chicago on Saturday morning after a very pleasant Porter flight and went directly to the Chicago Hilton - the Host hotel. Traffic was a disaster and the crowds were awful. I tried to keep my anxiety and panics in check as we checked into the hotel - which we were happy to hear we didn't have to pay for the second night (2 night minimum when we booked) and could get 4pm checkout for an extra $50. It was a bit stressful as Barry was meeting up with the guy we bought my bib from, I was checking in and the crowds were wearing on me. But then all that stress was over and we were happily checked in, grabbed a quick bite and then off to the expo. The line for the shuttle to the expo was incredibly long and it was quite chilly out so we grabbed a cab - great decision. The expo was crazy busy. We picked up Barry's race kit and made our way through the expo. It was a madhouse! We grabbed a few things we were looking to buy - compression calf sleeves for us both and compression shorts for Barry and a couple of pieces of official race wear. Then we high tailed it out of there back to the hotel for a short nap before dinner. why did I think racing with 45,000 people was a good idea? We had decided to partake in the race sponsored pasta dinner at the hotel and it did not disappoint. It was nice to watch the coverage of the 2011 Marathon while stuffing ourselves with 3 types of pastas, salad, bread and cookies. A++ for the pasta dinner. Then it was off to bed to try to sleep. I had the typical night of restless sleep before the race and we were up at 6am. The biggest decision was what to wear - I settled in on my 3/4 length lulu pants and my long sleeve thin lulu top with a warm and cozy hoodie to keep me warm before the race and hope some Chicagoan enjoys it this winter! I choose perfectly and was comfortable the entire time! We were in the second wave starting at 8am so we watched the TV coverage of the start of the elites at 7:30 and then left the hotel for the short walk to the start line. The race organizers do a very good job and while there were about 38,000 people running, everything went smoothly. I was in the corral ahead of Barry but was able to slip behind the gates and join him before the race. Before we knew it we were pushing forward, then running, then finally crossing the start line. This race is AMAZING - the spectators are insane. It is like running through a 42.2km parade route with spectators lining the entire way! There were times when they were 10 deep and only a few times just a few but every second of that race there were spectators cheering you on. Of course the course was crowded and there was a lot of bobbing and weaving and dodging. Barry and I were running well and nailing the pace. My Garmin was a little screwy the first few KM because we had to run through a pretty long tunnel so it wasn't very accurate with our actual pace but we were the KM spilts 6:05, 6:02, 5:58 ... I kept checking in with Barry making sure he was doing ok as this was his race, not mine. We continued on with most KM clocking in just under 6mins. You feel like a rock-star running this race with all the spectators. We had to stop somewhere around 9km for Barry to pee in the park and somewhere before 20km for me to hit the port-o-potty but besides that we just kept running. I felt awesome, singing and dancing, high fiving and running. Barry was doing awesome; I kept waiting for him to start walk breaks but he kept running like a champ. We took water at most aid stations and were bang on taking a gel every 45 minutes. I also took a few sticks of twizzlers, a mini snickers bar and a few jolly ranchers along the way (I like candy). I did take a few sips of gatorade now and then to keep my electrolytes from dipping too low as I didn't have salt pills. Luckily it was cool and it wasn't a problem. Then I came to the 30km mark. I felt amazing. My feet felt great, my legs were strong and I felt like I could run forever. I had to make a decision. And while I had planned, and I had the train fare ... I think I always knew that as long as I wasn't flighting any pain I would finish this race. I asked Barry what he thought I should do and he wasn't very pleasant so I decided to see how I would feel if I pushed my pace a little. So off I went and I felt great. I stopped at the next water station and waited for Barry. When I saw him I told him I was going on and I would see him at the finish line and off I went. I felt great - I was flying - passing everyone, singing, high-fiving and loving this race. I was clicking off the kilometres with the last 4 coming in at 5:27, 5:25, 5:26 and 5:12! Yes, I definitely negatively split the race! I finished with an "official" time of 4:13:04 - Ok really it's Manuel Villarreal's time ... I felt so awesome when I finished I actually thought to myself - 3:45 for a BQ - no problem! Of course the race conditions were perfect. Cool temps, light winds, flat course. Had I not been pacing Barry, I would have definitely come in under 4hours - but this was NOT my race! It's 2 days after the race and I'm happy I ran the entire thing. My legs feel just as good as they did after my 30km run 2 weeks ago and I'm sticking with my training plan. I think mentally running the full distance was a huge positive for me. I know exactly what 42.2km is so when I tackle that distance again in under 4 weeks I know I can do it. Running an Ironman is a very mental game and now I have tackled a 4km open water swim, a 180 km bike and a 42.2km run. Now I just have to put them together! 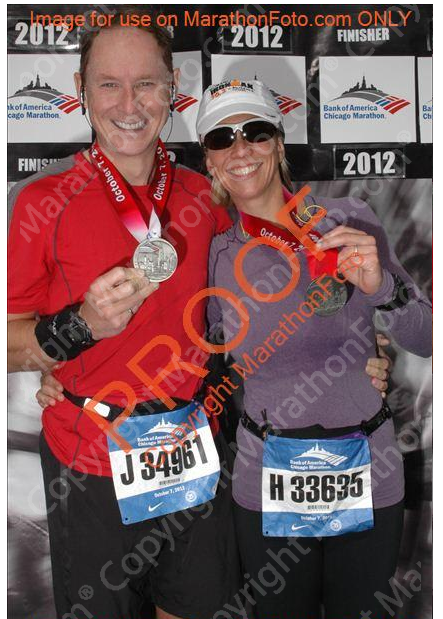 The Chicago Marathon is amazing and if I don't get into NYC next year - I will run it again!